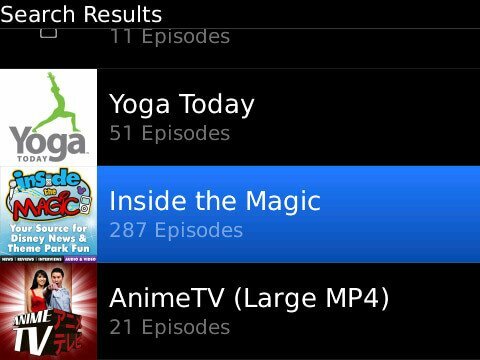 The Inside the Magic podcast is among the first 1,000 shows to be included in the new BlackBerry Podcasts directory, launched today by Research In Motion (RIM). The free application and service allows BlackBerry smartphone users to download and enjoy our podcasts over Wi-Fi or cellular networks. Downloaded episodes can be stored on a microSD card to be enjoyed at any time. Push technology can also be used to notify you when new episodes are available. BlackBerry Podcasts is available free on BlackBerry App World for BlackBerry smartphones running BlackBerry OS v4.6 or higher. 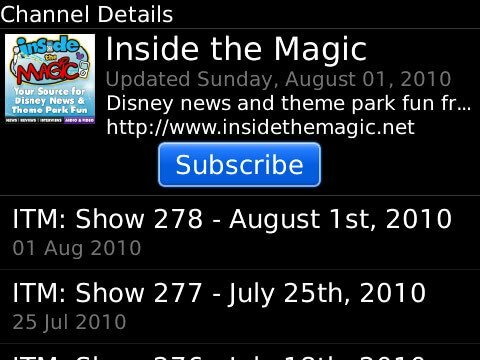 Outside of the BlackBerry world, everyone else can download and subscribe to the Inside the Magic podcast for free on our podcasts page and on iTunes. Thanks to John for supplying the screenshots!